NOTE: Because of very HIGH DEMAND and this is a promotional item, please allow 2 to 4 weeks for delivery for products shipped to the US (up to 6 in popular holidays like Christmas, Valentine's Day, Chinese New Year, etc.). We know a quick delivery is important to you and we are working hard to achieve that! Our Fashionable Knit Hats are the perfect fit for the pony-tail lovers of the world! ★ 100% stretchable soft acrylic. ★ Perfect for pulling your messy bun or high ponytail through on chilly days. ★ Keep your whole head warm without your bun or hair in the way, high or low opening, depending on how you wear it. ★ Time saving and convenient design for leisure, snow sports, camping, outdoor activities. ★ GREAT LOOK: No matter if your hair is thick, thin, curly, wavy, straight, coarse or fine, if you wear it up and wear beanies, our BeanieTails are for you! From smooth flowy ponytails to messy buns and everywhere in between, this hat will keep you warm while showing off your hairdo. Perfect to wear on a bad hair day to take your hair from drab to fab and get all the compliments! Also looks great with braids, sock buns, and other up-dos. Available in two tone, tricolor and four color options. ★ GREAT FIT: BeanieTails have the same awesome fit as our marled ribbed knit soft stretch Beanies (8” long by 9” wide lying flat), but with the option of putting your hair up, this beanie adds even more comfort! Cozy and cute, it’s a perfect hat to work out in to keep you looking super fashionable, and keep your hair up and out of the way. Wear hat tighter around the head for a high pony tail or bun, or back further and slouchy for a lower pony tail or bun. ★ WHEN TO WEAR: Beanie Tails are great to wear while exercising in cold weather to keep your hair up and your head warm while you workout. 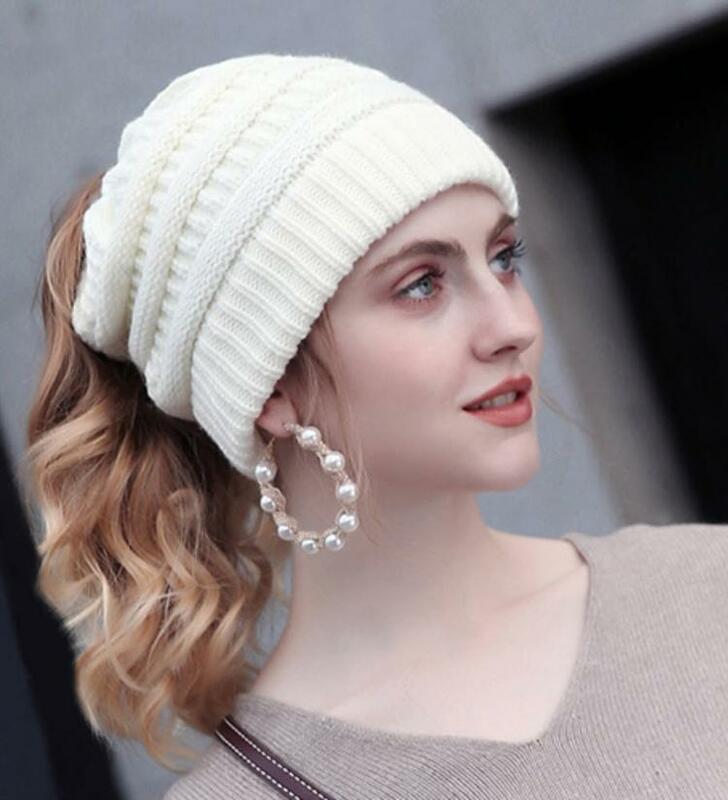 More fashionable than other work out ponytail beanies, this one is also adorable for every day wear with your favorite T-shirts, jeans, winter coats, boots, jackets, vests, scarves and more. Also great for camping, biking snowboarding, hunting, skiing, riding four-wheelers, running to the store, a girls’ night, shopping, going to the movies, and so much more. ★ GREAT QUALITY: This awesomely unique and versatile ponytail beanie cap is 100% acrylic with a durable and stretchy elastic band to adjust to any size or style of hair. Machine wash on a cold, delicate cycle and hang to dry.